What do the Slave Trade and Your Favorite Drink Have in Common? Rum. No other liquor has stronger connotations of tropical paradises, lofty sea breezes and thanks to certain movie franchises, pirates. Rhode Island even has its own rum brewed by the folks over at Newport Storm, Thomas Tew, named after a swashbuckling pirate of the same name who sailed the seas, allegedly founded an anarchist pirate colony and died fighting Mughals in the Red Sea, all while drinking lots of rum, because that’s what pirates do, right? Myth and legend aside, the modest drink of pirates was big business for 18th century Rhode Island. These days our brands are Del’s, potholes and corrupt politicians. In the 1700s, our state was known for rum and the slaves we traded for it. RI slave merchants controlled anywhere between 60% and 90% of the American slave trade during the pre and post Revolutionary periods. 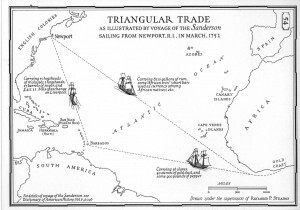 Most of the traders were based in Newport, with only the town of Bristol surpassing it by century’s end. Rhode Islanders had been slave trading since the late 1600s, but it was the rum that let colonial Lil Rhody compete with the European trading powers. Our special variety of rum was referred to as guinea rum. Dozens of distilleries operated statewide, with the best and biggest making more than 1,000 gallons of rum every week. It was our biggest export for a while, with at least half of all manufactured rum being exported elsewhere. Over the course of the entire slave trade, Rhode Island shipped almost 11 million gallons of the stuff to Africa. Slavers would sell the rum to British slave forts in return for African slaves. The slaves would be taken to the Caribbean and exchanged for sugar, molasses and other raw materials needed back in Rhode Island to be made into rum. 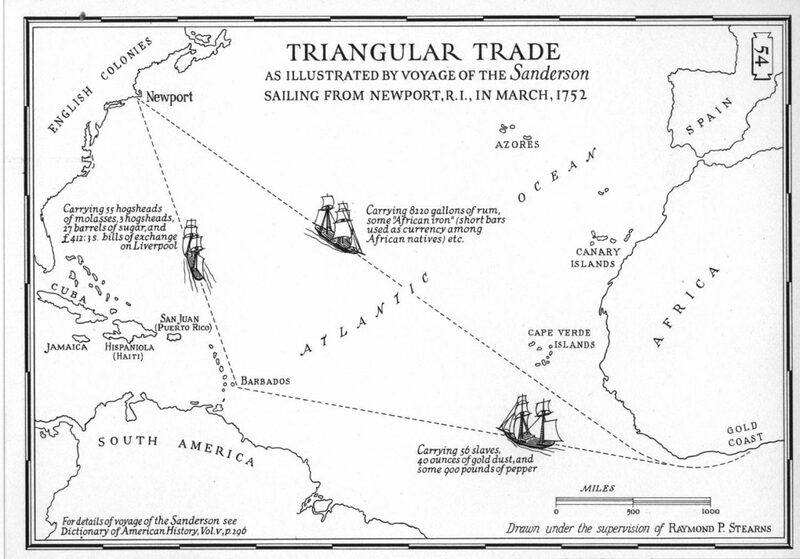 This trading process from Rhode Island to Africa to the Caribbean back to Rhode Island was known as the triangle trade. You probably learned about it broadly in school, but not that RI had a special place in it. Rhode Island slavers were so effective they earned the nickname ‘rum men’ in the Atlantic trade, and the special guinea rum was a highly sought-after commodity. Slaves could be bought using the rum, with prices cited in gallons of rum rather than regular currency prices. Typically, the only other market commodity with that kind of trading power was that old European white boy standby: gold. Despite a brief interregnum brought by the American Revolution, rum and slave-trading went hand in hand until slave trading was outlawed in the early 19th century, despite the fervent, bellicose complaints of slavers. Rum and slaves brought a huge amount of wealth into Rhode Island. But it was wealth built on the subjugation of an entire race, and the beginnings of a systemic American apartheid system that haunts us to this day. Halfway through the 1700s,, slaves made up at least 10% of the Rhode Island population, a number that outclassed every other New England colony. As much as it tries to hide it, Brown University is named after a member of one of Newport’s most prosperous slave traders. When you pour rum and Coke into your glass this warm season, instead of just thinking of some tropical heaven, think of the ghosts of Rhode Island’s past in some very dirty business. To learn more about Rhode Island’s involvement in the slave trade, join the Tales of the Slave Trade walking tour in Bristol. It starts at Linden Place, which was owned by the DeWolf family, another prominent RI family involved in the trade. For tickets and times, visit lindenplace.org/slave-trade-walking-tour.